The opossum is the only marsupial (carries its young in a pouch) in North America. Opossums have 50 teeth; the most teeth of any North American mammal. Opossums have prehensile tails, which allows them to hang upside down by their tail, but they can only hang by their tail for a short time. Opossums are mesopredators, like raccoons and skunks, and help control insect, small mammal and bird populations. Since they are omnivores, they also play a role as seed dispersers. As scavengers they help reduce the number of carcasses in their home range. Finally, opossums are an important source of food for predators such as owls, hawks, coyotes, foxes, raccoons and bobcats. Opossums belong to the Didelphidae family (New World Opossums). Adults are the size of an average house cat, weighing six to 15 pounds, and are 24 to 33 inches in length (body and tail). Males are typically larger than females. Opossums have white fur tipped with gray or black and white guard hairs. They have a long, narrow snout, pink nose and bare ears. The inner side of the ear is black. Their tails are nearly as long as their body and are almost hairless. Because their ears and tails lack fur, they often suffer frostbite on these body parts during Illinois’ winters. 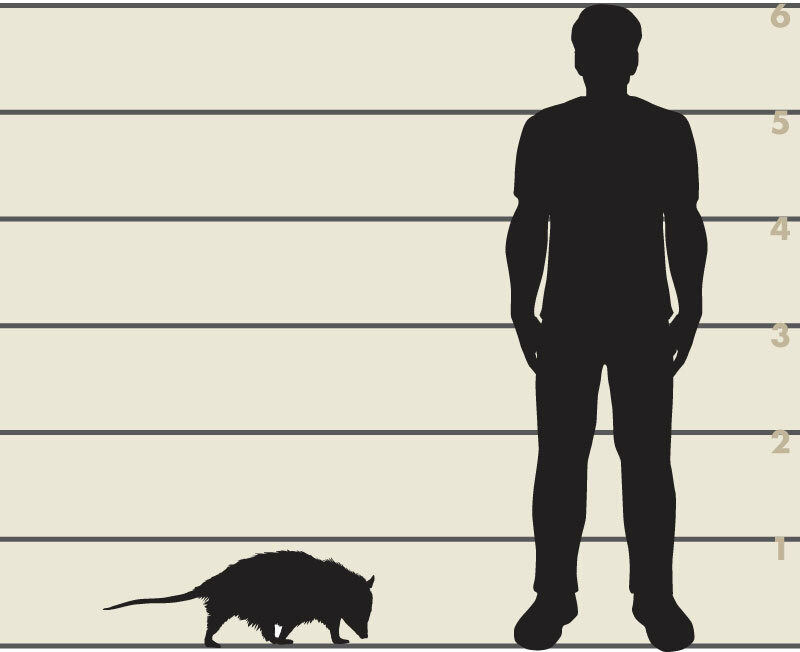 Size comparison of a six-foot tall man and an opossum. Opossums have five toes on each foot similar to raccoons. 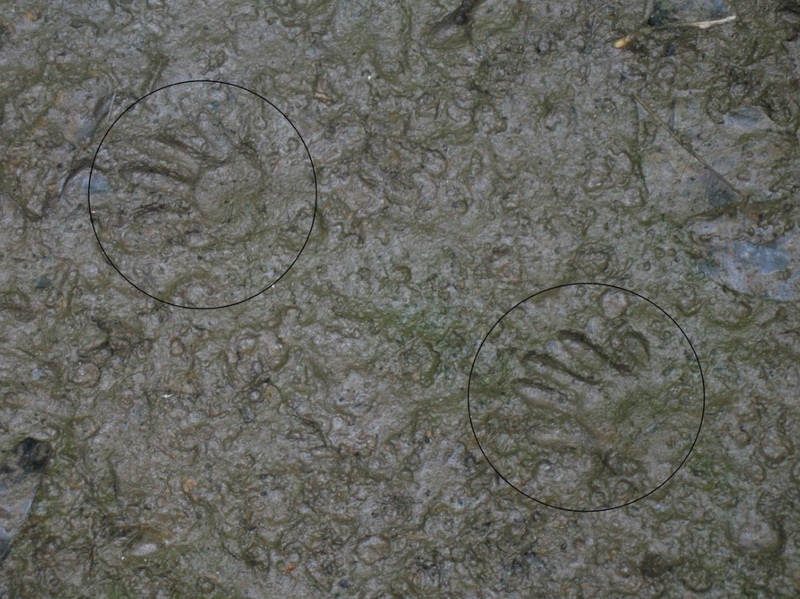 However, it is easy to distinguish opossum tracks from raccoon tracks. An opossum’s rear tracks resemble a baby’s handprint. This is because the inner toe on each hind foot is opposable, lacks a claw and resembles a thumb. Virginia opossum tracks resemble a baby’s handprint. An opossum’s front and rear tracks are usually close together, with the rear track falling on top of or just behind the front track. If the animal is moving slowly a tail drag mark may be noticeable, but an opossum typical holds its tail off the ground when walking. 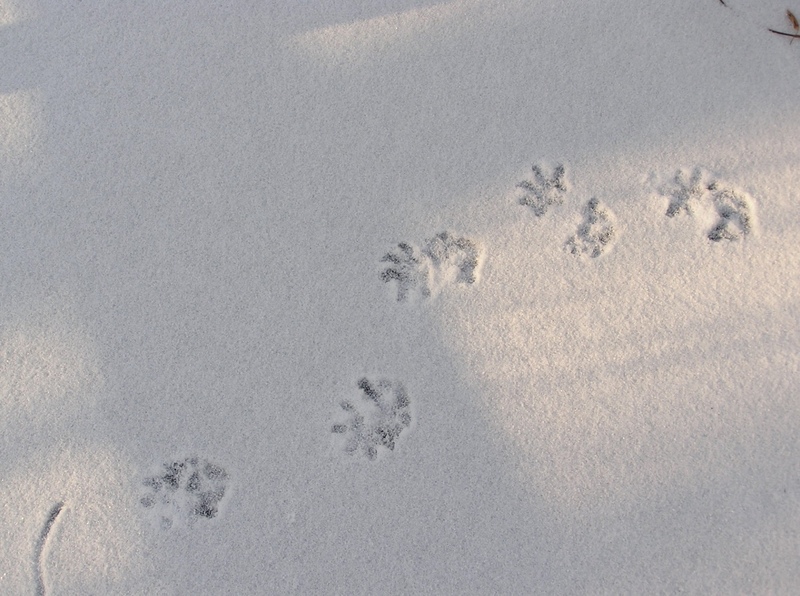 Virginia opossum tracks in snow. Note how the hind tracks overlap the front tracks. Opossums are common throughout Illinois. They are more abundant in the southern part of the state, especially along the Wabash, Mississippi and Ohio rivers. A study of opossums in central Illinois estimated there were 300 opossums per square mile during mid-summer. Opossums are most abundant in midsummer. However, many opossums do not survive their first year, and the population drops by late winter. 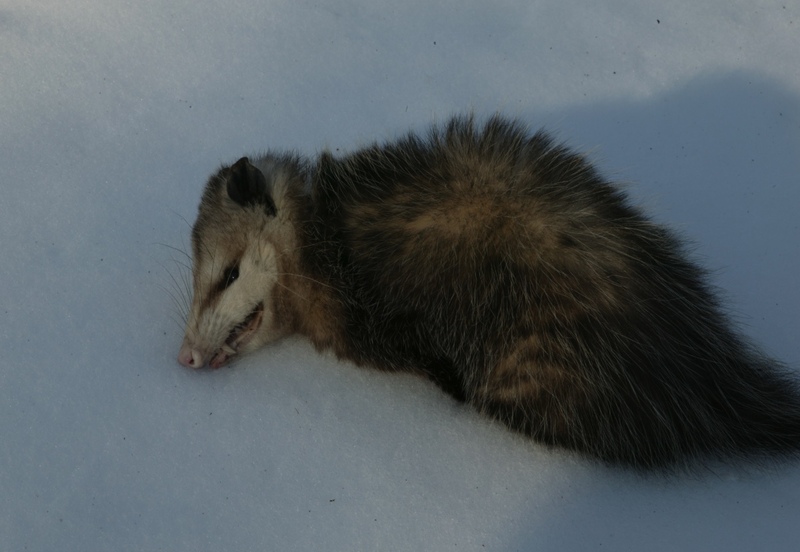 Opossum playing dead on the snow. Opossums are mesopredators, like raccoons and skunks, and help control insect, small mammal and bird populations. Since they are omnivores, they also play a role as seed dispersers. As scavengers, they help reduce the number of carcasses in their home range. Finally, opossums are an important source of food for predators such as owls, raptors, coyotes, foxes, raccoons and bobcats. Opossums do not pose a public health concern. They are often infected by parasites, but there are no known risks to humans. Opossums are resistance to rabies but may still be carriers of the disease. Horse owners should be aware that opossums can be carriers of a protozoan, Sarcocystis neurona, that can cause equine protozoal myeloencephalitis (EPM), a degenerative neurological disease of the central nervous system that affects horses. Horses can become infected when they consume feed or water that has been contaminated by infected feces containing the protozoan sporocysts. Not all infected horses will show symptoms, but those that do will require long-term, expensive treatment. To prevent possible transmission make sure the feed and water sources used by horses cannot be reached by opossums. Opossums live in or near wooded areas, especially those near water. They are adapted to edge habitats and are often found in urban areas. 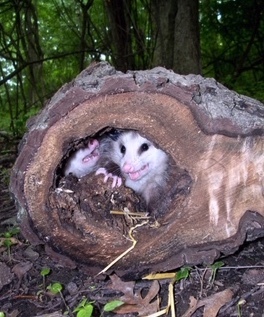 Opossums do not build their own shelters. They take cover in abandoned dens or nests of other animals, sheds or old buildings, cavities in rocks, brush piles, and in hollow trees or fallen logs. Home ranges of 12 to 264 acres have been reported. Opossums are omnivorous scavengers. They eat insects, fruits and berries, earthworms, bird eggs, amphibians, and plants. However, the main component of their diet is carrion. Opossums are often killed by vehicles while scavenging for carcasses along roads. Opossums breed in late January and early February with some individuals breeding again in May. Females have one to two litters per year. The average litter size is seven to eight young. The female gives birth to underdeveloped young approximately 13 days after mating. At this stage, the young are about the size of a bumblebee and they must crawl to their mother’s pouch where they continue to develop. Young opossums leave the pouch when they are two to three months old but remain near the female so that they can return to her pouch to nurse. During this stage of their life, they may be seen riding around on the female’s back. By the time they are three months old, they will be weaned and on their own. 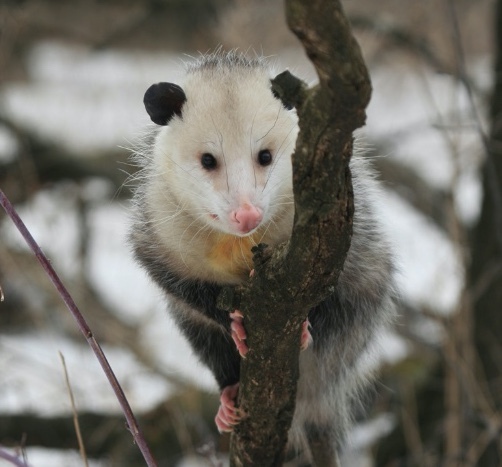 Opossums have many predators including dogs, great horned owls, coyotes, foxes, raccoons, bobcats, raptors, and snakes. Many are also killed each year by vehicles. The average opossum lifespan is two years. Opossums are most likely to cause problems by getting into garbage or raiding bird feeders. Though they do not usually cause damage, they can startle people when they take shelter in wood piles, sheds, or under decks or porches. Remove brush or trash piles. Store firewood away from buildings or fences and keep the wood at least a foot off of the ground. Keep garbage stored correctly in secured cans with tightly fastened lids. Close garbage dumpster lids each night to prevent opossums from climbing or falling into the dumpster. Regularly check your home for signs that it needs repair and make the repairs quickly. Check the integrity of chimney caps and attic vents and repair any holes. Deny access to sheds or to spaces underneath decks or porches. For porches or decks built within two feet of the ground, dig a trench at least 10 inches deep around the deck’s perimeter. Attach 1⁄2” x 1⁄2” mesh hardware cloth or 1″ x 1″ welded wire from the top of the outside joists to the bottom of the trench. Leave six to eight inches of wire at the bottom and bend it out at a 90° angle. Fill the trench with soil or rocks. Add lattice or other cover for aesthetics. Habitat modification and exclusion techniques are usually sufficient to prevent problems with opossums. 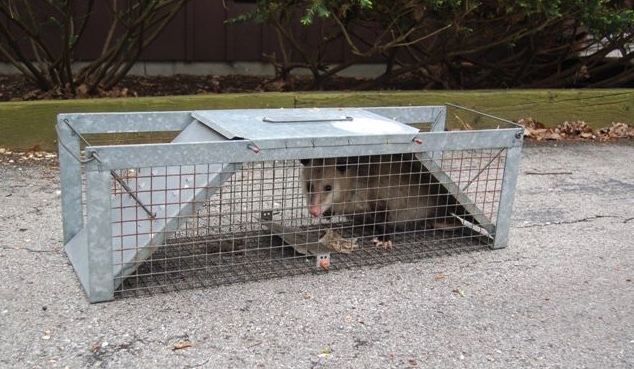 If there is a situation that warrants removal, you can call a nuisance wildlife control operator to trap and remove the opossum for you for a fee. 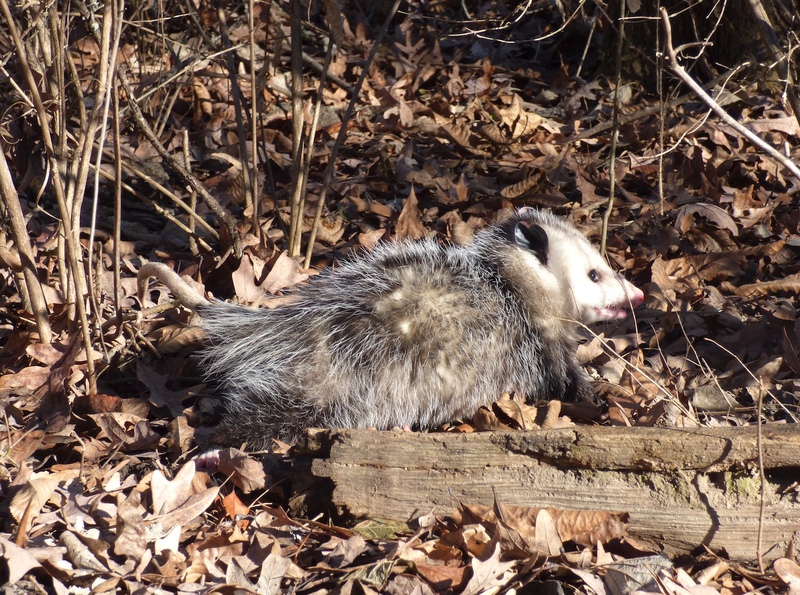 If you want to remove the opossum yourself, you will need to request an animal removal PERMIT from the Illinois Department of Natural Resources district wildlife biologist assigned to your county. The biologist can provide information on options for resolving problems, including issuance of a nuisance animal removal permit. Opossums can easily be trapped at night using a Tomahawk trap baited with cat food. 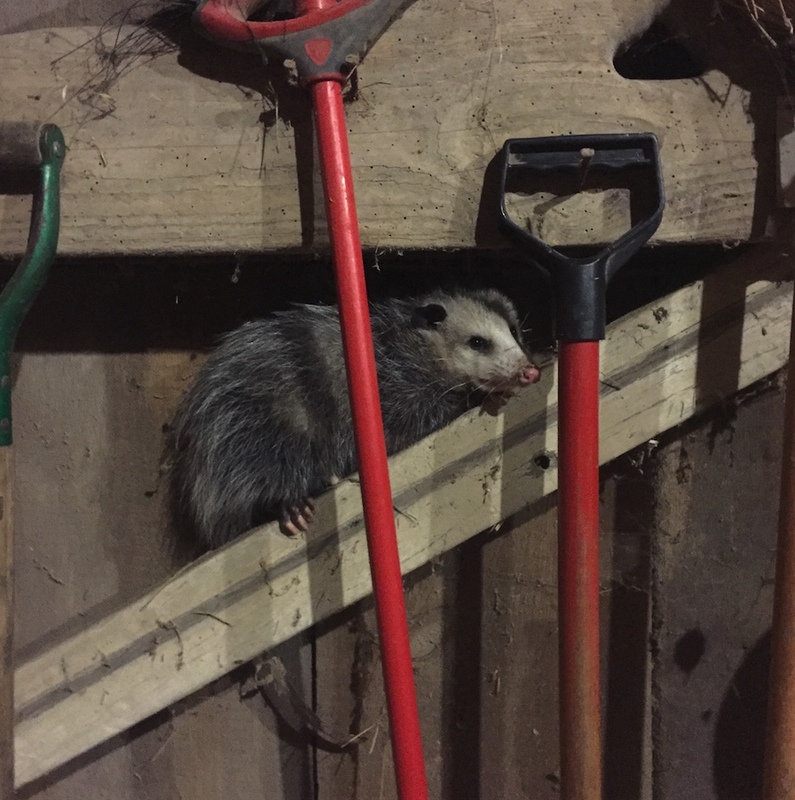 If the opossum is to be released on property other than the site where it was captured, prior written permission must be obtained from the landowner. If the animal is to be released, the opossum must be relocated into suitable habitat within 24 hours of capture. If the opossum will not be released onto the property where it was captured, it must be released at least 10 but not more than 40 miles from the capture site unless the Illinois Department of Natural Resources biologist specifies otherwise. In Illinois, opossums are protected by law as a furbearer. In urban areas, opossums that become nuisance animals may be trapped and removed if an PERMIT is issued by an Illinois Department of Natural Resources district wildlife biologist. In rural areas, a hunting or trapping license is needed to harvest an opossum. There is no limit to the number of opossums an individual with a hunting or trapping license may take during season. 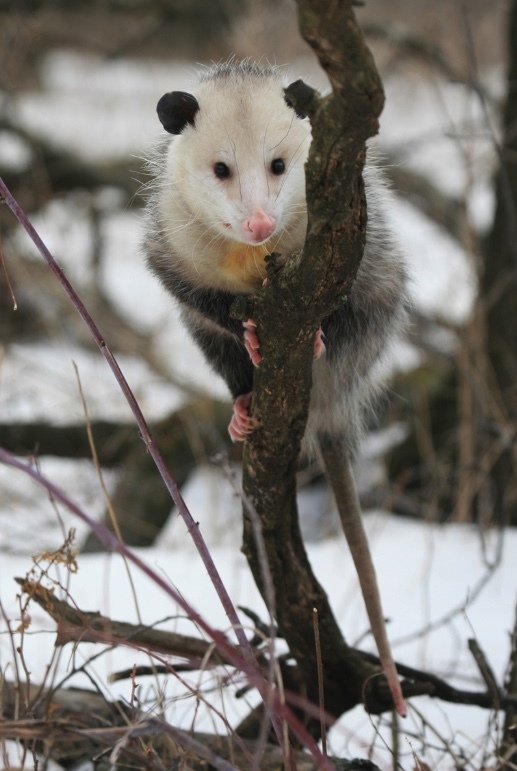 Opossums may be hunted or trapped mid-November through mid-February. Click HERE for full hunting and trapping regulations.